Our great friend, Heather Hudson, is set to premiere her new film, The Women and the Waves 2, in San Luis Obispo in a few short weeks on March 18. If you happen to be anywhere close to that area of the coast, be sure and check out her latest film. Tickets sold at the door so bring all your friends and line up early. The Women and the Waves 2 stars Jeannette Prince, Kristy Murphy, Mary Bagalso, Ashley Lloyd Thompson, Demi Boelsterli, and Isabelle Radis. Film Description The Women and the Waves 2 is a documentary surf film that celebrates women and their unique approach to surfing and life. The film looks at the state of surfing today from a feminine perspective and features positive role models that give back to people and the planet. Following in the footsteps of the groundbreaking 2009 film, THE WOMEN AND THE WAVES; THE WOMEN AND THE WAVES 2 continues to explore the culture of surfing in relation to six surfers and their lives both in and out of the water. The launch point of inspiration to make this film came in the fall of 2013 when two friends featured in THE WOMEN AND THE WAVES experienced two pivotal moments in their lives. After a valiant twenty-year battle against cancer, Robin Janiszeufski-Hesson ‘Zeuf’ was a few months away from death, and Ashley Lloyd Thompson was a few months from giving birth. One goes out. One comes in. Life rolls on. Just like the waves that are eternal. When someone we love dies, we stop, breathe and reassess our own lives. Zeuf was a friend and mentor to many and an inspiration to all. We only have the present moment, so how will we live it? THE WOMEN AND THE WAVES 2 emphasizes the notion that surfing is more than just a sport; it is a lifestyle, and serves as a backdrop for connections made between people, honoring the natural world, paying homage to loved ones past, and celebrating the cycle of life. Ultimately, the film is the portrayal that a life filled with gratitude for one another and the world we live in, is a life well lived. And when the joy of surfing is added to the equation it makes life that much more sweet! 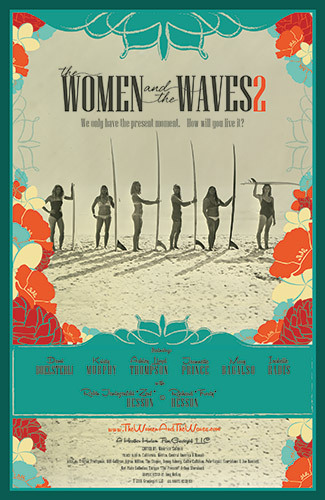 For upcoming screenings, information, or to purchase the original, award-winning 2009 film, The Women and the Waves, please visit womenandthewaves.com.